Distimo, a young Dutch company that is entering the slowly but surely saturating market of mobile application distribution and monitoring services, has just released an interesting report about Apple’s App Store. It contains some noteworthy findings about iPhone app pricing and the significant influence prices have on ranking. Eventually, Distimo aims to release market-wide data on all application stores (Android, Blackberry, etc.) on a monthly basis, free of charge for broad reports on the U.S. and as a paid service for people who would like to get some insight into what’s happening in other countries or specific verticals. 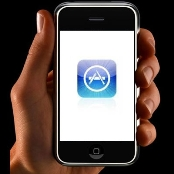 They’re starting with the grand daddy of all app stores, Apple’s, and deliver some interesting findings in a first report based on publicly available data for the month of April, 2009, which you can download here. Data for only one month may be insufficient to make any final conclusions, but Distimo has been comparing the pricing for the 100 most popular iPhone apps for a while and found prices are clearly going down. The startup expects that trend to continue in the near future, too. 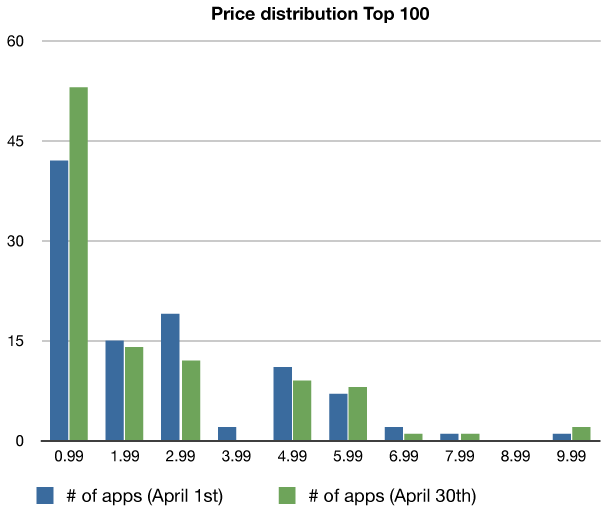 As for the numbers: in April, the total combined price of all apps in the Top 100 decreased from $265 to $244, or down 7.9%. The biggest driver for the average price drop was the increase of $0.99 apps, with 53 carrying that price at the end of the month compared to only 42 on April 1. No real surprise there, although I still think the iPhone is an excellent device for business purposes too. What I thought was noteworthy was that the rankings for the top 100 applications, both free and paid, change every single day, which means it’s an extremely volatile marketplace. The categories Games, Social Networking and Entertainment were most popular in the free app section, with three, two, and two apps in the top 10 list, respectively. For the paid section, games were even more popular with 5 out of 10 apps in the Top 10 for that category. Distimo found it was hard for both free and paid apps to maintain a high ranking, but paid apps seemed to be more able to do so than free applications. The most popular paid app (Flight Control) maintained the number one ranking 22 days in a row, while the most popular free app (Skype) was only able to maintain the number one ranking 7 days in a row. From all the free and paid apps that have been in the Top 100 in April, 83 apps released an update during the same month. That represents 24% of all apps that were in the Top 100. Distimo analyzed the rankings and prices of the three most popular apps with price changes over time, giving insight into the price elasticity. 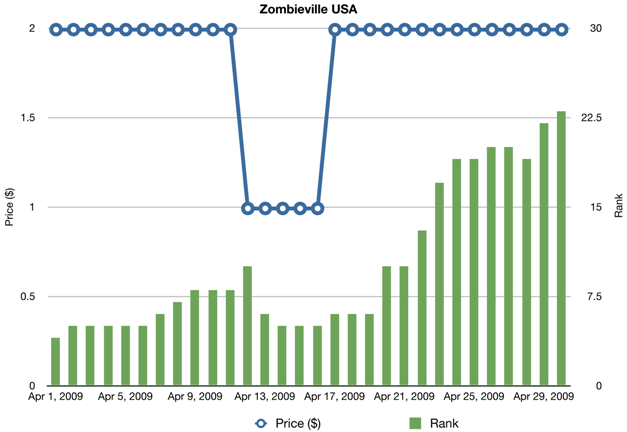 The first app that was looked at was Zombieville USA (first graph). From the 1st of April, its rank decreased steadily, from No. 4 on April 1st to No. 8 on April 11th. On April 12th, the price of the app was lowered, from $1.99 to $0.99. This had an instant effect on the ranking; it increased from No 10 on April 12th to No. 5 on April 14th. 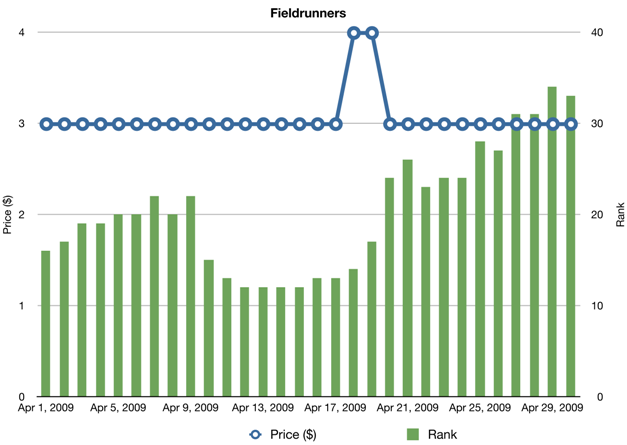 The graph of Fieldrunners (second graph) shows a similar effect. 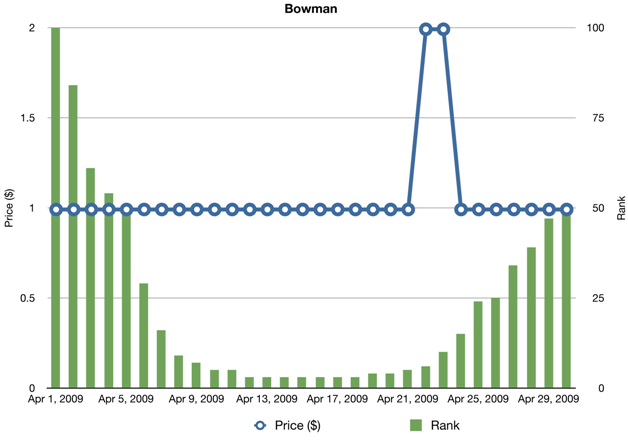 Similar story for the Bowman app (third graph). The price of this app was raised, from $0.99 to $1.99 on April 22nd. The app lost its No. 5 ranking instantly, decreasing to ranking No. 49 in the Top 100 on the 30th of April.